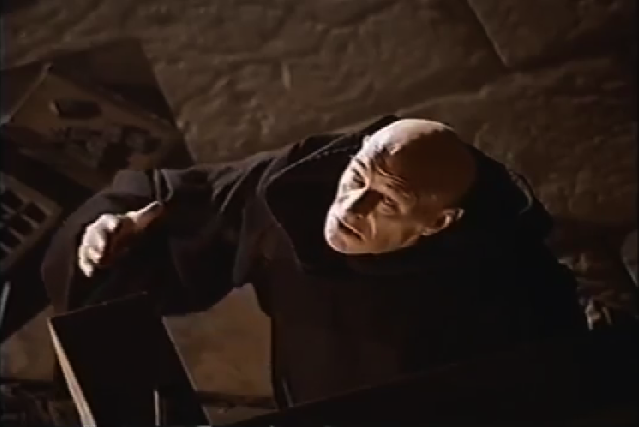 Richard Harris as Frollo, yells No! 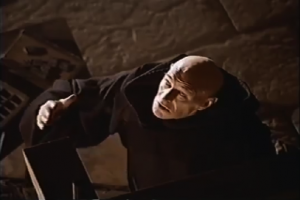 The 1997 Hunchback was directed Peter Medak. Medak is no stranger to TV movie directing and TV directing in general. The directing in this adaptation is mixture of weird angle frames and total utilitarian shot-verse-shots. The competing style of the artistic angled frames and the shot-verse-shots makes for an interesting visual style and by that I mean silly. It’s almost like Medak didn’t know what he wanted when composing the frames and the shots. He shot conversational scenes very utilitarian for efficacy and then he got bored and decided to tilt the camera for visual interest. But the weird competing approaches to directing style just make this version look very awkward. I suppose the awkward directing style is a compliment to the awkward writing choices, so at least it’s consistent.